The simple butterfly outline template below, can be used to make cute homemade cards out of the beautiful paper or gift wrap of your choice. 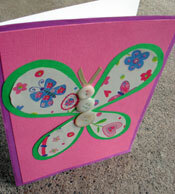 This butterfly outline card is easy and the design is super flexible. 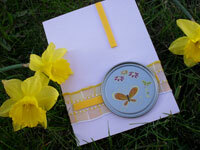 It all starts with a simple but handy butterfly template that you can use to cut out the basic elements of a butterfly. By using this simple card making template... you can choose your own combination of colors and patterns. I personally, love to use gift wrap for the inside wing pieces. Note... This is one of my budget-friendly card making ideas, designed to help you make use of basic paper and craft supplies that you probably already have on hand. You can find more budget-friendly card making ideas here! For this easy card making idea... the wing pieces, in the butterfly template provided, are used with the beautiful paper of your choice. You may also choose to use part of the template for the body and a marker for the antennae... or do what I did and use ribbon and buttons for the body and antennae. Another option you'll have, is to adhere the butterfly wings flat on the paper, or you may choose to use dimensional stickies such as Pop Dots to make unique 3d cards. 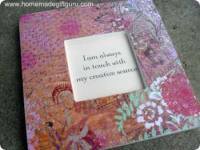 Card Blank: white 5 x 6 1/2" ...here's how to make a card blank. Paper for the Card: I used white and a pink patterned paper (with a gingham design). Paper for the Butterfly: I chose pink paper for the larger part of the wings and gift wrap in coordinating colors for the inner wing area. Note: If you need a program to view the butterfly template .PDF you can download Adobe Reader for free here. Tip... Pop dots are an awesome card making supply that I keep on hand. However, you can try cutting a few small pieces of craft foam to use in place of pop dots if needed. To make things simple, I refer to the colors of paper I chose. As you read the instructions, just swap my paper choices for the colors and patterns you chose as needed. Print butterfly template on standard typing paper. Cut pink patterned paper to 5 x 6 1/2". Glue to card blank and allow to dry. Cut white card stock to 4 1/2 x 6". Center and glue to front of card and allow to dry. Tape template to pink paper. Tape remaining template to a piece of gift wrap (or patterned paper). Position and glue "B" wings on corresponding "A" wings as shown to the right. Position the wings and body (buttons and ribbon if you're using them) as desired on card. ...to make 3d cards, use pop dots as follows: glue down the inner point of each wing and place one large pop dot or 3 small dots near each outer tip. This will create the look of wings popping up and out from the body. 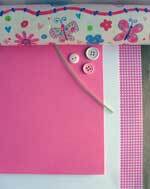 If using buttons, glue each button with adhesive or use a mini pop dot to adhere. If not using buttons, cut the body piece using the template and glue it down. If using ribbon, cut two 1" strips of ribbon with a pointy end. 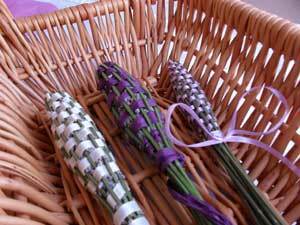 Glue each small piece of ribbon to look like butterfly antennae. If not using ribbon, a marker works fine for giving the butterfly antennae. Allow to dry and your done!!! 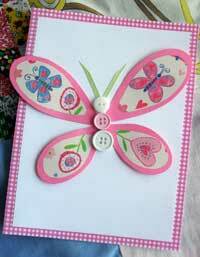 Above is the finished butterfly outline card with Pop Dots under the wings and mini Pop Dots under each button. 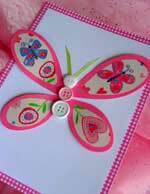 This butterfly outline card makes a great Easter card, birthday card or just a cute homemade greeting card to say Happy Spring, Thank You or even Happy Mother's Day! Guess who I made this inspiring decoupage frame for??? She LOVED it!